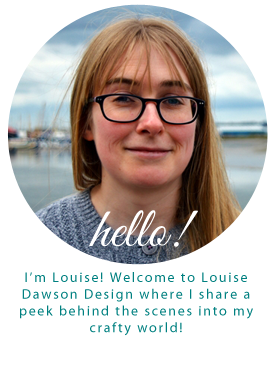 Louise Dawson Design: The Small Project Challenge- The Flo-Jo Knicker Making Kit! The Small Project Challenge- The Flo-Jo Knicker Making Kit! Back in January in this post, on a mission to be organised and reduce the amount of half finished projects I have on the go, I shared my goal of completing one small crafty project each month in 2015. I've called it The Small Project Challenge! For the challenge in February, I made knickers! A while back I was searching for quirky craft kits to try and I discovered the Flo-Jo Knicker Making Kit from the Flo-Jo Boutique. The kit contains everything you need to make a pretty pair of knickers, from the pattern (in size 8-18), pretty fabric (there are lots of pretty prints to choose from, including Liberty), frilly knicker elastic and ribbon for a bow. The great thing as well is that if you trace the pattern off you can keep the pattern to make more pairs! As a first attempt, this pair is by no means perfect- the elastic is a little over gathered in places and the finish could be neater (I really need those pinking shears! )- but I had a great fun afternoon making them and that's the main thing! There was something very therapeutic about making them and I'm excited to choose some fabric to make some more. I'm hoping that practice makes perfect! Have you discovered any quirky or unusual craft kits? Do share!